The man needs no introduction and along with May day, entire Tamilnadu also rejoices for this great man’s birthday. Ofcourse we all jointly celebrated Thala’s birthday yesterday with a lot of pomp and pleasure. 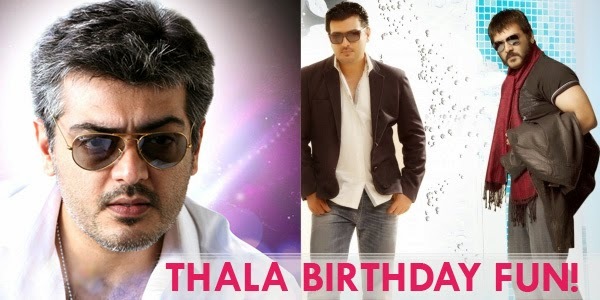 Here is a look at how our Thala celebrated his birthday. Having turned 43 this year, Thala Ajith was happy about his completion of Veeram that released earlier this year. Wanting to spend some quality with family, Thala spent his birthday his near and dear ones including his best buddies. Known for his humane nature and knowing the generous contributions he does on his birthday, there were blood donation camps done at various places. Of course the fans also had a fun time cutting cakes for their thala. What was amazing to find out was that over 2000 fans gathered at his residence at Thiruvanmiyur to celebrate and rejoice. Ofcourse with the social media in boom, fans went crazy in conveying their wishes. Tweets counting up to a few thousands and Facebook statuses adding up to few thousands too went viral, all dedicated to the wonderful man. This birthday yet again was celebrated in a special manner considering the movie ‘Amarkalam’, the first movie with wife Shalini, his 25th film in his career was re-released at many places. The one’s who love the outdoors chose this option. Ofcourse the television lovers chose to watch him on screen, at home at the comfort of their couch. ‘Veeram’ blocked for the evening primetime was the one much awaited amongst all. ‘Aarambam’ too was telecast on TV, which ofcourse was also one of his hit film in the recent past. We definitely can understand how happy every fan was celebrating one of the wonderful actors’ of South India’s birthday. Raaga.com takes this occasion to wish the actor many more years of success.